Back in Ohio where we belong! Aestiva Finnish Spitz believes in showing and breeding only the best in Finnish Spitz. My show dogs are also my home companions and my best friends. I breed for temperament, health, soundness and adherence to the ideals of the breed standard. I hope this site shares some of my love for the breed with you. Let me introduce myself and my dogs. 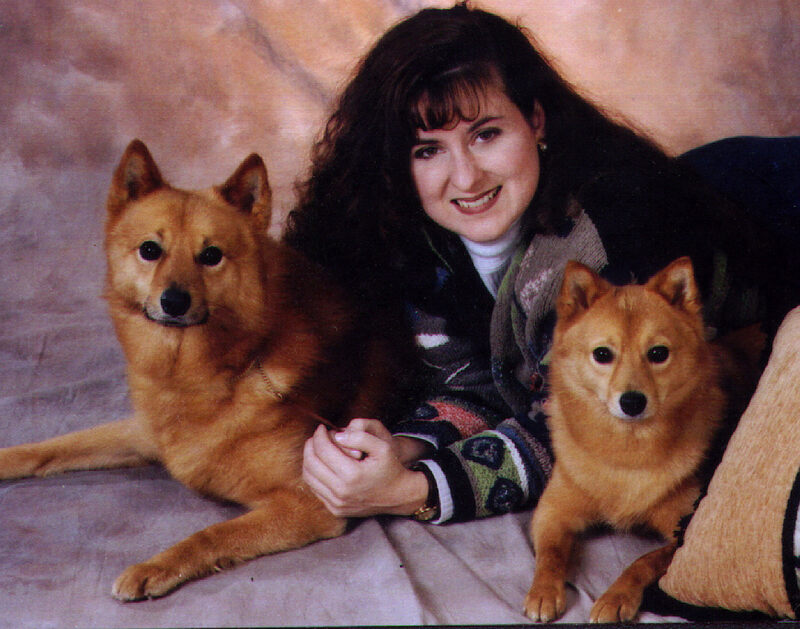 My name is Melissa Carr and I love and share my life with three Finnish Spitz. I have belonged to the Finnish Spitz Club of America (FSCA) and met the breed at the FSCA National Specialty in 1996. I got my first Finkie, Rennie, in mid-1997. Since then, I have produced two litters of puppies, some of which have gone on to success in the show ring, while others are pampered pets and companions. This site will tell you a bit about my dogs. Enjoy the site and I hope to hear from you soon! Rennie and Pan with Melissa in December 1999. Web page counter installed April 03, 2004 10:28 PM.